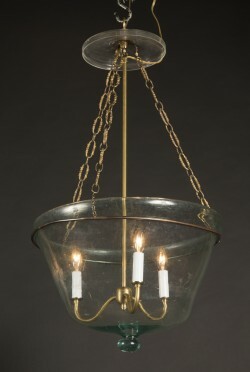 The glass of this light is an antique melon globe, hung by a decorative chain with a three light internal stem. 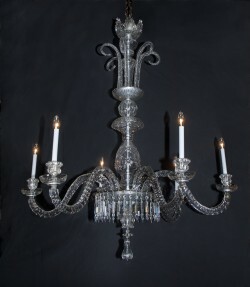 The chains and stem hang from a glass plate. The glass globe itself is nestled within a net created by a series of chains. This style of melon globe light is a specialty of the French Antique Shop. 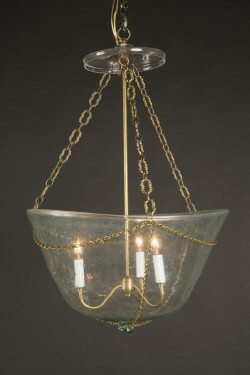 The glass of this light is an antique melon globe, hung by a decorative chain with a three light internal stem. The chains and stem hang from a glass a glass plate. The glass globe is held by a bronze ring that wraps around the outer lip of the glass. This style of melon globe light is a specialty of the French Antique Shop. 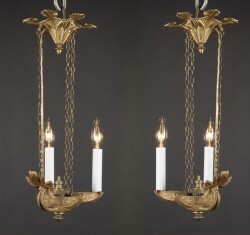 These small hanging lamps were originally made to store and burn oil, and have been converted for electricity. 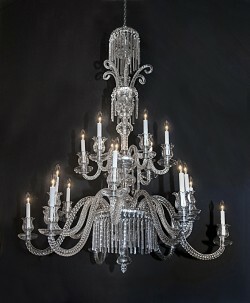 The lamps themselves are elegantly decorated, and able to pair with many different styles.